A Central Maine Power smart meter displays electricity usage at a business in Freeport in this October 2010 file photo. The meters remain suspect by some customers who have received very high bills. 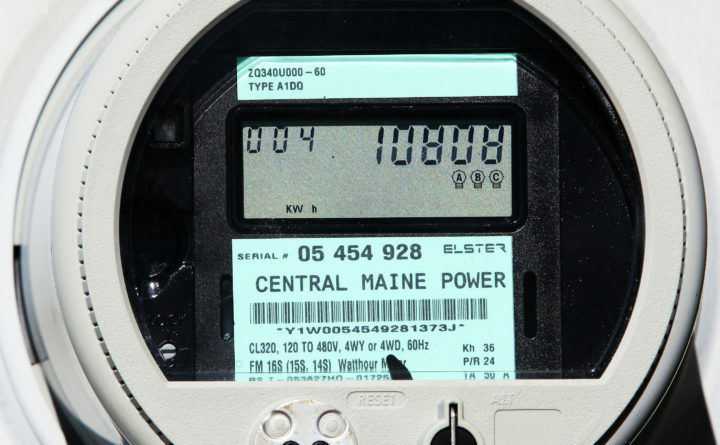 A complaint by customers seeking a class-action lawsuit against Central Maine Power for alleged high billing is on hold until the end of October. “The justice wants to see what happens at the [Maine Public Utilities Commission] before ruling on the motion,” said Sumner Lipman, one of the lawyers attempting to gain class-action status for the lawsuit. Lipman made his comments in an update written Tuesday to Jud Hopkins, the liaison between the lawyers and a Facebook group of more than 7,700 members called CMP Ratepayers Unite. Hopkins shared Lipman’s note updating the case on the closed CMP Ratepayers Unite Facebook page. That group states as its mission that it is a forum to unite all CMP customers who have seen a dramatic increase in their energy bill that cannot or will not be explained by CMP. The complaint was first filed in July 2018 in Cumberland County Superior Court, but since has been moved to the Business and Consumer Court in Portland. It initially focused on alleged overbilling and CMP’s lack of response to customer complaints, but in August was amended with a complaint alleging fraud in the way CMP tried to blame customers for the high bills. The complaint alleges that more than 97,000 CMP customers have been overcharged 50 percent or more on their utility bills, and another 200,000 customers have been overcharged up to 50 percent. In his update on March 19, Lipman wrote that the defendants in the case, CMP and its parent, Avangrid, filed a motion to dismiss the complaint on the basis that the PUC has exclusive and primary jurisdiction. The court has not ruled on that motion, he said. However, he said the court stayed the current proceedings until the end of October, halting further legal action on the case in court. “The justice wants to see what happens at the PUC before ruling on the motion,” he said. The PUC had initiated an investigation into the high bills in 2018. Many customer bills spiked following the October 2017 wind storm, which coincided with CMP’s changeover of its customer billing and customer support systems. The commission launched a full investigation into the high bills in January 2019 after it received a report on the storm response from an independent auditor. The PUC has split what was once one case on the bills and customer service issues into two cases, one focusing on the high rates and CMP’s smart meter billing system and the other on customer service. “We are hopeful the PUC will represent the public and not a foreign corporation and be accountable for the obvious overbilling and poor customer service,” she said. The conference allows intervenors like Hopkins who are involved in the case to get questions answered by the auditor, Liberty Consulting Group of Pennsylvania. Hopkins was accompanied to the PUC meeting by fellow CMP Ratepayers Unite members and intervenors Lauren Loomis and Valery Harris. The Liberty report found that weather, for the large part, was the culprit for high bills, although it did find some irregularities affecting certain customers. The report also blamed CMP management for poor customer service in explaining the problems to ratepayers. However, ratepayers continue to complain about high bills on the CMP Ratepayers Unite Facebook page and in public comments on the PUC website. Lipman said that in response to the court granting a stay, the lawyers for the class-action lawsuit filed separate motions to reconsider that ruling and to modify the order. “If our motion is granted or the order is modified, we will seek to add additional plaintiffs as well as add additional defendants,” Lipman wrote. He said he also expects some changes in the legal team representing the plaintiffs. He said attorney John Pottle of Eaton Peabody based in Bangor has just been hired to represent the interests of class-action lawsuit before the commission. He promised another update in the next two to three weeks.